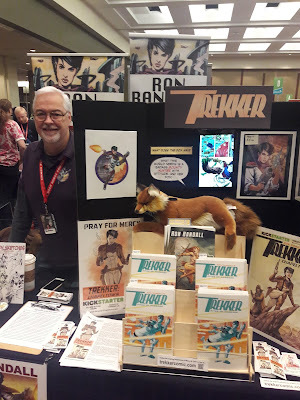 Ron Randall is a longtime friend of the site, and there's a good chance he's worked on one of your favorite Marvel or DC characters, even if you didn't realize it at the time. A member of Helioscope, a collective of some of the best creators in all of comics, Ron was among the first to do creator-owned work at Dark Horse Comics, with a series called Trekker. Before we get to the interview, a few things to note. 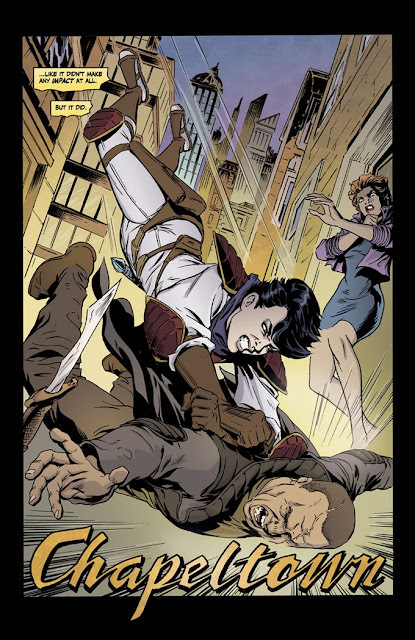 Trekker is the story of Mercy St. Clair, a bounty hunter in a sci-fi world that's spread out across worlds and has the feel of the same kind of noir that you think of when you envision Cowboy Bepop or Do Androids Dream of Electric Sheep. There's battles and gunplay and plenty of action, as Mercy tries to keep herself upright--and in enough bounties to survive. It's a very fun romp, but as you move deeper into the series, there's things you notice that take the world in some moral gray areas. Mercy may want to stay out of the fray, but as you'll see (or maybe you know already! ), she'll be forced to re-examine her world view. And punch/shoot a lot of people. Don't forget the shooting. 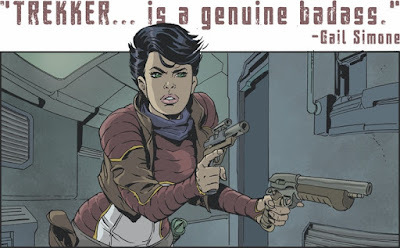 If you enjoy sci fi in the mold of Flash Gordon, but with a stronger overall narrative and a bit more of a dark Western feel--basically pulp adventure that crosses genres, even if the setting remains in space--you'll really dig Trekker. You can find it on the web right here, and Dark Horse has several trades of the series so far. Rob McMonigal: Tell me a little about your career background. Ron Randall: I've been in the business for a long time now. I've worked on everything from Swamp Thing and Warlord to Predator and Venom to Supergirl, Star Wars, and Space Ghost. Rob: I forgot about Venom! (Ron chuckles.) Talk about what it's like to be there at the start of the rise of independent publishing, when Dark Horse and First and others were starting. Trekker comes out of that time period, correct? Ron: Yes, it does. It was really exhilarating. The industry was changing, right at the time I was getting into it, just starting to be a professional in comics. DC and Marvel were the only game in town when I started. But the distribution system and direct market were coming on the scene, and that gave an opportunity for companies like Eclipse, First, and Dark horse to come out, broadening the horizons of books people could do. They weren't trying to go head to head with Marvel and DC. They weren't trying to do the next superhero. So you had a lot of other things, adventure stories and mysteries. I always liked superhero comics, but I had a strong attraction to adventure books like Flash Gordon or Prince Valiant, and Tarzan. I liked those kind of stories, too. Having this new type of comic that you could do, for a lot of creators, it was a breath of fresh air. Rob: That was a long time ago, and the time frame of writing the books has been lengthy. But Mercy's story takes place in about two years of her time? Rob: Did that change the course of the book? Ron: No--for those who don't know the history, I created her at the start of Dark Horse, but for a lot of reasons, the stories have come out in a sporadic, scattershot way. But the story was designed to be ongoing series of adventure. From when I originally conceived it, there was a continuous arc, the gradual evolution of Mercy St. Clair as a human being. Individual stories are designed to stand on their own as a tight adventure, but when you read them together, it tells the overall story. She discovers that both the world and Mercy herself are more complicated than the simple black and white world she started out in. It was designed this way from day one, even though there were interruptions. That made it easy to pick up where I left off. It's very gratifying to hear that despite the publishing gap, the stories feel like they hold together. Even if it takes time to get to draw it, I've got the basic ideas together for each arc. Fortunately, now I am in a place where I can work on Trekker every week. I don't want there to be big long gaps in getting the story out anymore. Rob: How does approaching a page change now from the 80s? Ron: The difference is style and pacing have changed. Before there were 7-8-9 panel pages with dense text, now it's maybe 4-5 panels with thinned out copy. Decompressed storytelling. I've tried not to make it a radical change with Trekker. The longest break was 10 years, but even so, the script had been done, so thee style and tone was the same as before. I've gradually opened it up more to feel more contemporary, but I keep it consistent because I liked the design then and I like it now. I wanted it to be strong and realistic and practical. I wanted to make the character vivid and real on a emotional level. These are the consistent things that holds the series together and makes it unified--the character is recognizable in look, actions, and voice. It's moderated a little bit but not a radical shift. Always me scripting the character. Rob: Not a new writer every arc? Ron: *Laughs. * When I first came back to Trekker, I was asked if there would be a reboot, and I said, no, I'm going to tell the next story. I want it to have great integrity. Someone who read first story or picks up a new story, it's the same Mercy St. Clair. Hopefully, I'm drawing it a little bit better, writing it a bit better, but it's the same series. That's very important to me. Rob: It has that consistency, but there's no way to tell in terms of the story that so much time as has passed from story A to story B. Are you using different drawing tools, maybe drawing electronically now? Ron: I made that shift gradually. I started working digitally to do the pencil art, but printed them out and inked them with same tools I used back in the day. As software got more sophisticated, and I could replicate the look that I'd done in the "analog" mode, it's helped my production time, it's been a fun evolution in my own style. Rob: I couldn't tell exactly where it had moved to digital. Ron: All the material in trade so far as been inked analog. Rob: Got it. That makes sense then that I didn't see a change. 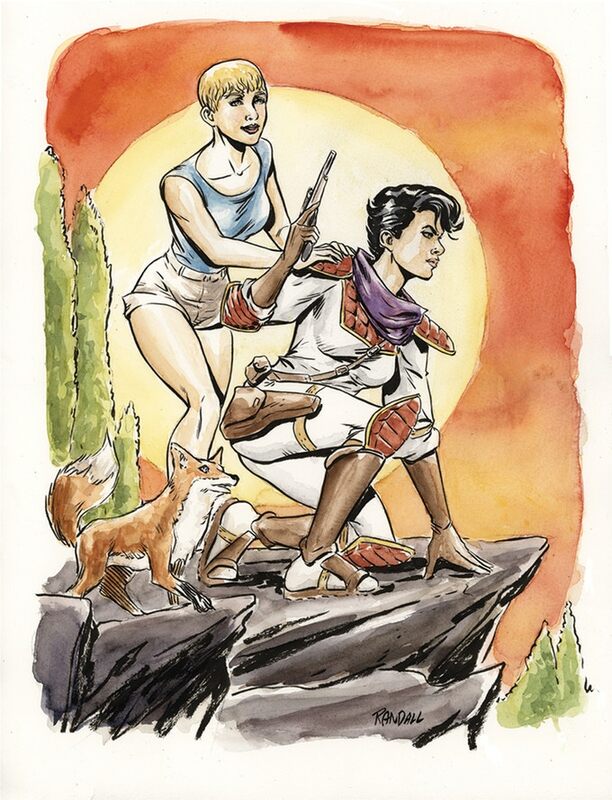 I understand a bit of how comics are made and the shift in tools, but I can't see it in Trekker, beyond the color, obviously, which is significantly better than what it was. Ron: Trekker was in black and white, then we moved to color, then some baby steps into modern coloring, there were some issues with that...but the toolbox is breathtaking now. Rob: Unbelievable what can be done with modern coloring. Ron: I'm doing my own coloring now. I'm not a color specialist, so I use tools that are within a range, which helps me stay consistent. The whole goal is for the series to hold together as one story, so if there are radical changes from one story to the next, it erodes the consistency I'm going for. I restrict the color approaches to a few solid techniques that I think enrich the art. I don't want the coloring to be driving the ship. Rob: Changing subjects a bit. Why do you keep returning to Mercy? Lots of creators do a few issues or arc with a character and move on, but you keep coming back. Why is that? Ron: She's really popular with me. Ron: The character is, but also the entire world. When I started the series, I started it because Dark Horse approached me with the phrase I remember crystal clear, "You can do whatever you want." I knew I'd never hear it again, so I took the opportunity to do the comics I wanted to do--my dream project. All the things I loved most about what I wanted to do in comics. Science Fiction. A Strong female character. A strong, resonant story that talks about the human condition. I built it for me in the day and I still find it compelling, both the world and the character, and I have a lot more stories to tell. I admired Hal Foster on Prince Valiant. It created a unified body of work. It rewards readers and that's what I have in mind. Maybe not consciously, but that mindset. Rob And it seems like there are a lot of people who are loyal to the character. Not a lot of smaller indie comics that I'm aware of that have a podcast devoted to them. Rob: From my perspective, the people who have signed on and said yes, I want to know what happens with this character, really are engaged in a way that we usually only see with licensed characters. Ron: I feel incredibly gratified with that kind of readership. Given choice between a shiny bobble readers flock to and then scurry away to the next bauble, or having an audience of people who really connect to that world and story and commit to it for the long haul--that's the audience I want. That's what I built the series for. It rewards that kind of commitment with a richer and deeper world. The reader has to make it come alive in their mind and heart. That's where I want to go is to their heart. I want that that investment, if they do that, to be rewarding in the long run. I want those kind of readers. I'm committed to doing this. Rob: Trekker's online now. When did you move to the web? Ron: 4 years ago? 5? A light bulb went off in my head: There's this thing called the internet. Id' heard about lots of about webcomics, and realized I could bring Trekker back in that way. I kept waiting for a time when Trekker could return, but I didn't want to return and do a short story, have one little book appear and drop off the landscape. 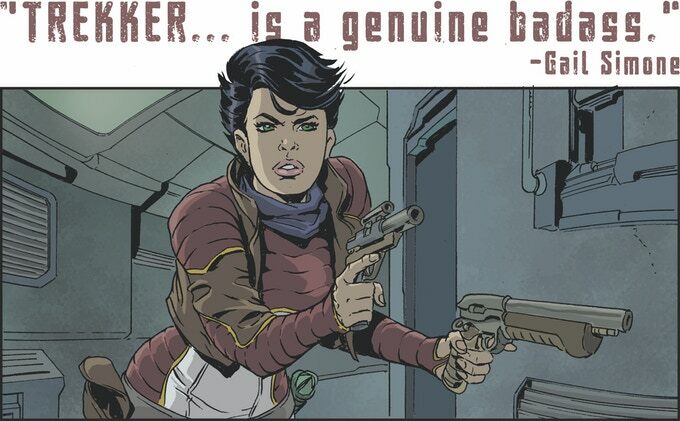 Rob: So like going back to Dark Horse Presents--here's 4 part Trekker return!, and then nothing. Ron: Right. When I realized I could make a website, I realized I could go back and use the original art--I'd never sold any of it--to make good scans, post them on the website, and bring the character back onto the landscape. Then the crucial step: I made public declaration that by the time existing stories were posted, new stories would be ready. I gave myself a deadline and committed to it publicly. Little tip: A freelancer needs a deadline. Once I committed to it, it was the motivation I needed, and I never looked back. Each week, there's one new page on the website. As the stories get done, I want to get them all into print. Trekker is not ideal as one page per week. I want reader to read the entire story, have it all in their hand. The website is to produce new stories on my own terms and help new readers discover the series. The ultimate goal is to get them in print. That's the format I want it to be in. Rob: Did you get people discovering Mercy as a new character on the web, or mostly old fans? Ron: It's impossible to know, but I do have both. I notice this when I go to conventions. I will have new readers who don't know character but say she looks badass. And others who come up and say they're happy to see the character back. But don't know the percentage. I'm grateful to all of my readers, no matter who they are. When I meet a new fan, I meet a new kindred spirit. Rob: How far ahead do you work? Ron: Several pages are always done in advance of their website appearance. Ideally, I'd like to have the print versions done first and use website as the teaser. I do work ahead. Anytime a page is posted on website, whatever that arc is, it's entirely written before I start--outline to script. By the time page 1 of a story posts, the entire story is written. I don't improvise. Rob: It has to be an advantage that you don't have to keep to a page limitation. Can do 40 pages or 70 pages, right? Ron: That's absolutely true. Both the web and trade paperback gives more elasticity in page length. It can be doubled edged sword, though. I don't regret learning how to write to a certain page length. You learn a lot about story structure, pacing, and detail selection through that discipline. Those disciplines pay off bigger and bigger dividends, especially now that you can have that elasticity. It's important to me that the stories are muscular. They're not padded. There's a reason for everything I include to be there. Everyone is busy with their time, and I want you to have a reason to be reading it. Rob: You even did that early on, in the first set of stories where she tries to escape. A character who helps her escape could have been a throwaway, but but he comes back and forms a whole arc in a later series. It's amazing to me how much of the little things you throw in get utilized later on. Ron: Again, that's the case of for a reader who invests over the long haul, it's important to me that it pays off. Planting the seeds, a background element here ,and three stories later we delve into it. Reader says, "Oh, that plays a crucial role." I just think that makes it a deeper, more satisfying read. Better than here's a shocking thing, here's a shocking thing, now the story's over, with no broader context. Rob: It's popcorn versus things that make you stop and think. I like popcorn but there's something to be said for things that to made you linger and there's a lot in to think over in Trekker. It doesn't overwhelm the comic, but there are things to consider, like how the government she's operating around isn't ideal. It isn't a Star Trek situation. It's seeded in there without it being an exposition dump or something that slows the pace. It's still here's this badass character getting into fights, but also more than that. Rob: I guess we should talk about the Kickstarter. That is the point of this interview! 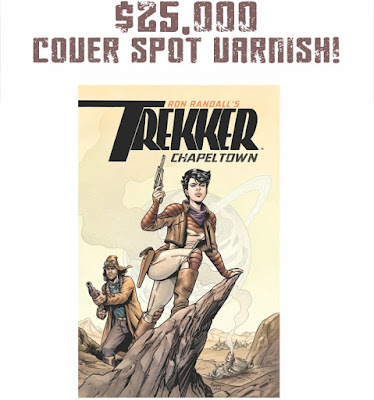 Ron: The goal is to get the latest Trekker arc into print, it's called Chapeltown. Mercy going off her home planet into a frontier town, seeking answers into her past, and gets caught up further into intrigues about the council and the town. By the end of the story, Mercy has to confront some choices that there is no going back from. It's a fun slam bang adventure, but its also a very pivotal story in the series. From this point on Mercy's life will be changed forever, but in a way that has all the thing we have had to the point as well. Rob: As much fun as it is to see her being a bounty hunter, it doesn't grow the character if that's all she does. Rob: This world building you've seeded is playing out, and it's a neat concept. Ron: Thanks! I started it with the bounty hunting and a variety of settings and adventures. But in the past, she's always circled back, even though it's had an impact on her, and making her change things. But the circumstances of the stories now forever move her into a larger stage, a more complex platform. Rob: I'm sure her uncle will love that. Ron: He'll have his moments. So yeah, this is a new chapter in Mercy's life and a new chapter in the series. I'm hoping Kickstarter will enable me to change the publishing pattern, stop the fits and starts and put it on a schedule. I want the story and the readers to be on a regular schedule. Rob: And what type of rewards are there? 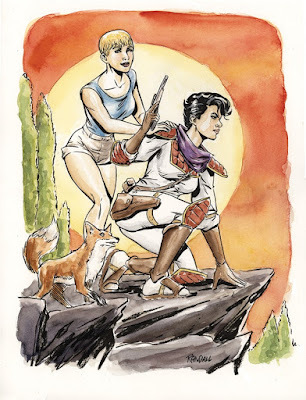 Ron: Everything from Kickstarter exclusive signed watercolor prints, some commissions, a few larger watercolor originals, and one level is a chance for the real dedicated Trekker fan to get a chance to be drawn into a story. One of those could be you! Rob: Also, they can get a copy of the book, too? Ron: At a low level, there will be digital PDF, and at a modest cost, from $15 or above, you can get a print copy of the book. Chapeltown plus extra features. Rob: Thanks for doing this, Ron. Always a pleasure to speak with you. Reminder: You can still jump into Ron's Trekker Kickstarter here! I highly recommend you do so--it's one of my favorite series, and on top of that Ron's a great guy who deserves all the success in the world. Start your journey with Mercy now, if you haven't already. Trust me!